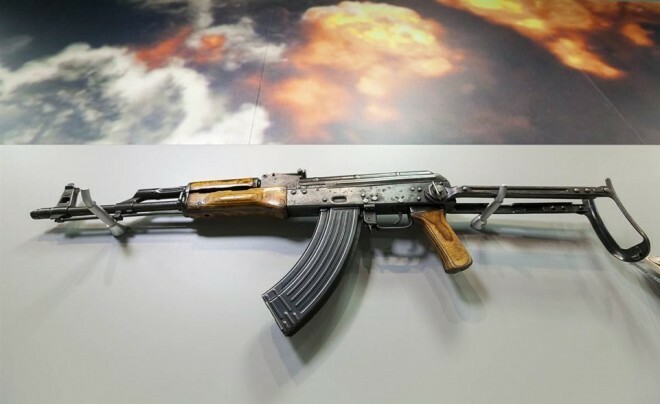 Osama Bin Laden`s AKMS that is housed in the CIA museum. Osama bin Mohammed bin Awad bin Laden (/oʊˈsɑːmə bɪn moʊˈhɑːmɨd bɪn əˈwɑːd bɪn ˈlɑːdən/; Arabic: أسامة بن محمد بن عوض بن لادن‎, Usāmah bin Muḥammad bin `Awaḍ bin Lādin; March 10, 1957 – May 2, 2011) was the founder of al-Qaeda, the Sunni militant Islamist organization that claimed responsibility for the September 11 attacks on the United States, along with numerous other mass-casualty attacks against civilian and military targets. He was a Saudi Arabian, a member of the wealthy bin Laden family, and an ethnic Yemeni Kindite. After his initial denial, in 2004 Osama bin Laden finally claimed responsibility for the September 11, 2001 attacks in the United States. The attacks involved the hijacking of four commercial passenger aircraft and flying them into the Twin Towers of the World Trade Center in New York City, New York and The Pentagon in Arlington, Virginia, destroying the former, and severely damaging the latter. It resulted in the deaths of 2,973 people and the nineteen hijackers. In response to the attacks, the United States launched the War on Terror to depose the Taliban regime in Afghanistan and capture al-Qaeda operatives, and several countries strengthened their anti-terrorism legislation to preclude future attacks. The CIA`s Special Activities Division was given the lead in tracking down and killing or capturing bin Laden. The Federal Bureau of Investigation has stated that classified evidence linking al-Qaeda and bin Laden to the September 11 attacks is clear and irrefutable. The UK Government reached a similar conclusion regarding al-Qaeda and Osama bin Laden`s culpability for the September 11 attacks, although the government report noted that the evidence presented is not necessarily sufficient to prosecute the case. Bin Laden initially denied involvement in the attacks. On September 16, 2001, bin Laden read a statement later broadcast by Qatar`s Al Jazeera satellite channel denying responsibility for the attack. In a videotape recovered by U.S. forces in November 2001 in Jalalabad, bin Laden was seen discussing the attack with Khaled al-Harbi in a way that indicates foreknowledge. The tape was broadcast on various news networks on December 13, 2001. The merits of this translation have been disputed. Arabist Dr. Abdel El M. Husseini stated: "This translation is very problematic. At the most important places where it is held to prove the guilt of bin Laden, it is not identical with the Arabic." Through two other tapes aired by Al Jazeera in 2006, Osama bin Laden announced, "I am the one in charge of the nineteen brothers. [...] I was responsible for entrusting the nineteen brothers [...] with the raids" (May 23, 2006). In the tapes he was seen with Ramzi bin al-Shibh, as well as two of the 9/11 hijackers, Hamza al-Ghamdi and Wail al-Shehri, as they made preparations for the attacks (videotape broadcast September 7, 2006). Identified motivations of the September 11 attacks include the support of Israel by the United States, presence of the U.S. military in the Kingdom of Saudi Arabia, and the U.S. enforcement of sanctions against Iraq. On March 16, 1998, Libya issued the first official Interpol arrest warrant against bin Laden and three other people. They were charged for killing Silvan Becker, agent of Germany`s domestic intelligence service, the Federal Office for the Protection of the Constitution, in the Terrorism Department, and his wife Vera in Libya on March 10, 1994. Bin Laden was still wanted by the Libyan government at the time of his death. Osama bin Laden was first indicted by a grand jury of the United States on June 8, 1998 on a charges of "conspiracy to attack defense utilities of the United States" and prosecutors further charged that bin Laden was the head of the terrorist organization called al-Qaeda, and that he was a major financial backer of Islamic fighters worldwide. On November 4, 1998, Osama bin Laden was indicted by a Federal Grand Jury in the United States District Court for the Southern District of New York, on charges of Murder of U.S. Nationals Outside the United States, Conspiracy to Murder U.S. Nationals Outside the United States, and Attacks on a Federal Facility Resulting in Death for his alleged role in the 1998 United States embassy bombings in Kenya and Tanzania. The evidence against bin Laden included courtroom testimony by former al-Qaeda members and satellite phone records, from a phone purchased for him by al-Qaeda procurement agent Ziyad Khaleel in the United States. However the Taliban ruled not to extradite Bin Laden on the grounds that there was insufficient evidence published in the indictments and that non-Muslim courts lacked standing to try Muslims. Bin Laden became the 456th person listed on the FBI Ten Most Wanted Fugitives list, when he was added on June 7, 1999, following his indictment along with others for capital crimes in the 1998 embassy attacks. Attempts at assassination and requests for the extradition of bin Laden from the Taliban of Afghanistan were met with failure prior to the bombing of Afghanistan in October 2001. In 1999, U.S. President Bill Clinton convinced the United Nations to impose sanctions against Afghanistan in an attempt to force the Taliban to extradite him. Despite the multiple indictments listed above and multiple requests, the Taliban refused to extradite Osama bin Laden. They did however offer to try him before an Islamic court if evidence of Osama bin Laden`s involvement in the September 11 attacks was provided. It was not until eight days after the bombing of Afghanistan began in October 2001 that the Taliban finally did offer to turn over Osama bin Laden to a third-party country for trial in return for the United States ending the bombing. This offer was rejected by President Bush stating that this was no longer negotiable, with Bush responding "there`s no need to discuss innocence or guilt. We know he`s guilty." Osama bin Laden was killed in Pakistan on May 2, 2011, shortly after 1:00 am local time by a United States special forces military unit. The operation, code-named Operation Neptune Spear, was ordered by United States President Barack Obama and carried out in a U.S. Central Intelligence Agency (CIA) operation by a team of United States Navy SEALs from the United States Naval Special Warfare Development Group (also known as DEVGRU or informally by its former name, SEAL Team Six) of the Joint Special Operations Command, with support from CIA operatives on the ground. The raid on bin Laden`s compound in Abbottabad, Pakistan was launched from Afghanistan. After the raid, U.S. forces took bin Laden`s body to Afghanistan for identification, then buried it at sea within 24 hours after his death. 10, 20, 30, 40 round box magazines or RPK 40-round box magazines. Also compatible with 75-round and drum magazines from the RPK.